IMG_3938.JPG, a photo by Southworth Sailor on Flickr. For our final day in NYC we headed downtown. We stopped first at Grand Central Station and walked to the Chrysler Building and the United Nations. Next, we had lunch near City Hall and then walked the Brooklyn Bridge with thousands of other tourist. It was in the mid-eighties by then so the vendors were selling lots of drinks. Back on the subway we headed for Battery Park to view the Statue of Liberty and the water traffic. We walked up Broadway through a street fair to Trinity Church and Wall St. Wall St. was closed except for a narrow walkway, presumably to deter the protesters. The protesters were confined to a park a few blocks away with plenty of police and media presence. We didn’t stop to watch the protesters, but made our way to ground zero and St. Paul’s Chapel, site of so much of the recovery effort. 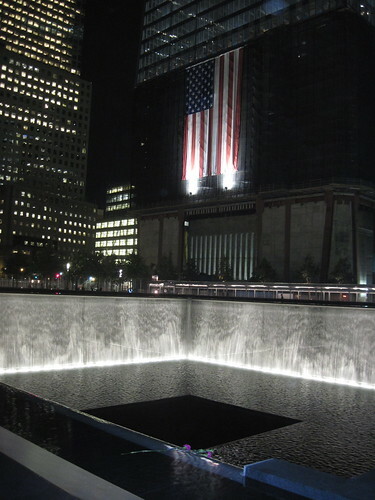 Since the memorial museum is not complete, this site offers a glimpse of the days following 9/11. We met Doug and Pam at the memorial site and found a sidewalk cafe for supper before our scheduled 7pm visit to the memorial pools. Unfortunately, the extra tickets did not work for Doug and Pam, so we had to say good-bye before entering the grounds. Even though the memorial is free, reserved tickets are necessary and the security procedures make airports look lax. The memorial pools are very impressive. The waterfalls drown out the noise of the city and the etched names of the victims around the perimeter convey the enormity of the tragedy. The visit to the memorial made a nice climactic ending to our weekend of touring. We headed back to the Hephzibah House for our 4 am taxi ride back to the airport.